Streetstyle from New York Fashion Week – which is your favorite look? 40+ Style » What you wore » 40+ streetstyle inspiration: Which of these New York Fashion Week street style looks is your favorite? 40+ streetstyle inspiration: Which of these New York Fashion Week street style looks is your favorite? New York is one of the style capitals of the world, and with good reason. Eyes turn to the New York catwalks for fashion week. But, just as stylish as the models on the runways are the women on the streets of the Big Apple. Away from the runways, the unpredictable New York weather in fall can be tricky to deal with. But those dashing to and from shows handle it with aplomb. Here 40+ Style photographer Denton Taylor turns his lens on some of the most stylish women in New York. Which look would you wear yourself? While it can be natural to turn to richer, darker hues as summer turns to fall, pale neutrals work beautifully in colder weather too. A chunky knit is worn with an equally chunky scarf, along with a crossbody bag and bang-on-trend round sunglasses. Note the on-trend detailing of the longer sleeve length. A look which shows that being fashionable and being stylish are not necessarily the same. This look is super stylish in a very classic way, which can be worn for year after year. An olive green coat is worn with navy booties and accessorized with hoop earrings. Another neutral look which is both cozy and perfectly on trend. The mix of neutrals goes beautifully with this stylish woman’s rich hair shade. The round bag brings this look perfectly up-to-date. Definitely a look for those who like to stand out from the crowd. 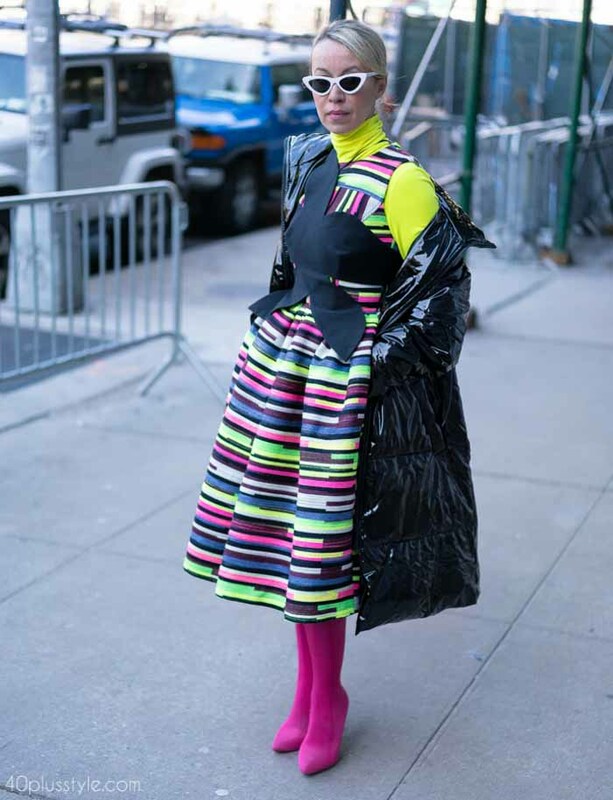 Layering was a big trend for fall, and this look features a turtleneck worn under this colorful striped dress, and topped with a long shiny puffer jacket. It is accessorized with long pink boots, which picks up the pink in the dress. Mixing different types of stripes can definitely work. A striped fur jacket is slung casually over the shoulders for a very luxe look. The midi length dress was another big trend for fall, and has also been seen on the spring and summer catwalks. Long boots are worn under the dress. New Yorkers are renowned for wearing a lot of black. Here, a black jacket, skinny jeans and turtleneck are styled with lots of gold detailing and pops of red, including red lipstick. There’s lots more inspiration here on how to wear black. Another look featuring black, but here this black midi skirt is styled with a white v-neck top featuring lace detailing, with a long gray overcoat. Ankle booties finish off this classic outfit. 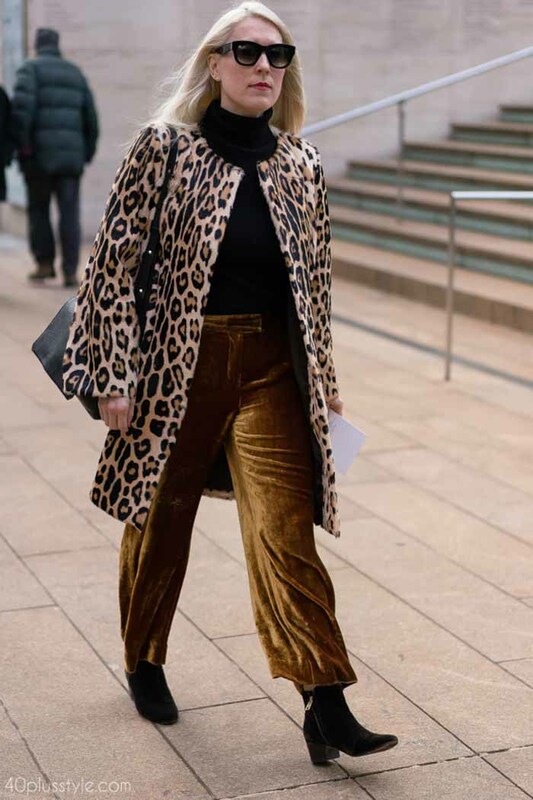 Leopard print is definitely one of the “it” items of New York street style. A neutral which packs a lot of punch, this leopard print coat is worn over wide-legged velvet pants. Which of these street style looks do you like best? What would you wear to New York Fashion Week? The neutral outfit, with the cream scarf and white bell sleeve sweater with a touch of black appeals. She looks smart, but totally comfortable. I have a white and off white pants obsession. How can I get away with my white flares in winter? Or my white straight legs? Or am I better off staying with my off white pants? When you wear it with confidence, it may work. Personally, I feel that a more creamy / off white works better in winter, which you could pair with a white blouse. I agree, I love the neutral look with the big scarf. A great way to keep wearing white/cream in the cold weather. I also like the monochrome look. I need a pair of black boots/booties desperately — they make everything look chic. I look forward to receiving your emails on trends and styles. A few years ago I was into Leopard print. I had a faux fur coat, shoes, handbag the works. Then I sold everything a year later. Now it’s back! I love Creams, and whites trech coats! I am not much for stripes. They don’t look good on me. I am trying to find my style still ever changing. PS I had make-up foundation makeover yesterday. Never knew I was warm tone! Still finding out about myself at the age of 55 ha. It’s always the case isn’t it that you give away pieces you wish you’d kept! Fantastic to hear about your makeover. You’re definitely never too old to improve your style and learn new tips and tricks! Re: the Monchrome photo. I HAVE that skirt! It’s deep navy and I got it at TARGET! for $18! Just shows that you don’t need to be rich to be stylish. I love your site and how you put things together. I just wish you wouldn’t perpetuate the notion that fur is fashionable. Yes there were lots of fur looks around the streets in New York during fashion week and we’ve avoided featuring most. I’d definitely substitute faux fur! I love the olive green classic coat. I am looking fotward to duplicating that style. Love the booties too. Riot of color is my favorite look! Not that I can pull it off myself but I certainly appreciate it on others. It’s certainly a look to get you noticed Eleni!